I'd like to start this post with a little self pat on the back: I've lost 15 and a half pounds as of today! Woo!! And it feels so good! Over the last many years, I have tried a LOT of things to lose weight. I mean, a lot a lot. First, there were the diet pills joined with eating better. Then there was just regular ole eating better and exercise. I lost a couple pounds that way but hovered at the same weight for a month before I got discouraged and ate an entire cake... haha! I tried Couch to 5k, in which I lost exactly zero fat but did gain stamina, which I appreciated... before I quit. In September last year, I drastically reduced my drinking, and this year, I am proud to say that I have only had one drink - and I was peer pressured into it. I kept my calories below 1200, and swam 2 to 3 times a week. I did that for more than three months, with no change. It was the first time I had been really inspired to stick to my goal, and I felt like a failure. 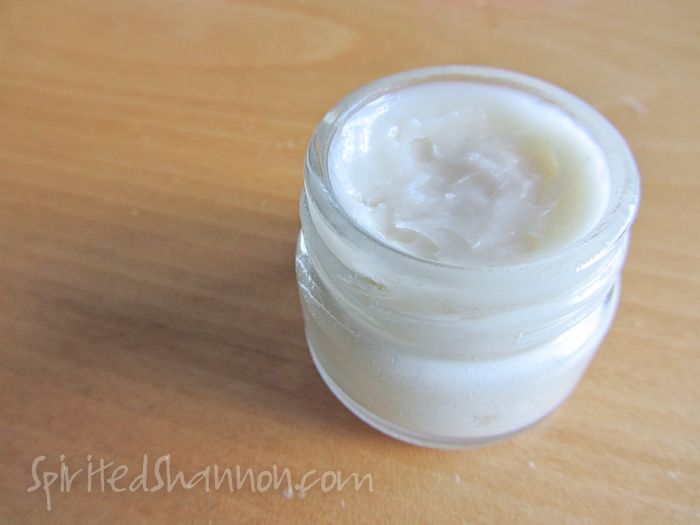 Back in November, I decided to switch from using commercial deodorant to homemade deodorant, and I have to tell you - the difference was amazing. I had never considered it before, but had searched out deodorants without aluminum tetrachlorohydrex gly as a teenager with my mom after she was diagnosed with Lymphoma. To our great surprise, some studies showed that aluminum tetrachlorohydrex gly was linked to cancer, and we just decided to figure out an alternative. At the time, the alternative was to just use non antiperspirants... but as the years wore on, I didn't necessarily enjoy sweating all the time (especially when my Alaskan self lived in hot and humid Ohio), and I switched back to regular antiperspirant. - I have started a new diet, and lost 7 pounds! Of course I will share this experience with you, but perhaps after a few more weeks of (hopeful) success. - There is a seemingly never ending pile of laundry to be done. We hang our clothes to dry and only have one rack, so usually I can only do two loads at a time before the rack is completely full. I'd love to dry some clothes outside, but winter means rain in Ireland. In the mean time, I stare longingly at my dryer. - I have been learning two new boardgames with V. We have mastered the simple version of Through the Ages which has about 89234729 tiny pieces, and V is reading up on how to play the hard version of the game. It's taken him two days of memorizing and reading and checking things out online which makes me worry that we'll never be able to play the advanced version of the game. Definitely not for the faint of heart. The other game is Arkham Horror. There's about a million things to learn in that game too, including about 9,000 tiny pieces, 3,000 different decks of cards for varying situations, and of course all the little cardboard bits representing your life, money, sanity, etc. So... we've been trying for a couple weeks now and have only gotten through part of one game. - The mornings are starting to get lighter. I have noticed that there's light in the bedroom at 7:45am now when only a couple weeks ago, it was completely dark until about 8:30. Hooray! Spring is coming! - Our winter has been very mild this year. Considering last year's frigidness, and snow, we have only had one tiny flurry and mostly stayed around the 40's F. I find myself ok with this. - Bilbo has been liking to snuggle up next to my side during the night, so I have been waking up with a ball of fur attached to my ribs. He has been very cuddly and I must admit that I kinda love it. - I have been drinking water and tea like a madwoman lately. - I have also cut out all sugar from my daily intake. Bread too. I miss bread. - Our house is growing moss. Not in the aesthetically pleasing way either. Just a slimy-ish green film on the outside of the house and on the patio. Time to rent a pressure washer, I think! - The wallpaper in our living room has started giving me anxiety. It's this crazy pattern of vertical squiggly stripes in shades of grey and black and white. I hate it and avoid looking at it at all costs. I am considering replacing it, but need to ask my landlords' permission. - I stubbed my toe.